Simplicity is about subtracting the obvious and adding the meaningful. In that definition are the two Simplicity Paths: tearing down and building up. Trim to the barest essentials. Look around at what isn’t needed and tear it out. Reduce. 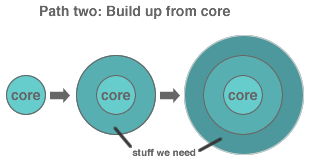 Start from the core and add on only what you need. Organize, so you know what is essential at this moment. Most (all?) of the time, you’ll need both paths, working together. Simplicity is a give-and-take. As you remove what you don’t need, add back the meaningful stuff. The core is my favorite part. It’s like a wall awaiting paint. I push myself hardest to tear down, because only then can I experience the project from the core, building out. Agreed. I like the nice info graphics that you made that really bring the point front and center. What’s an example of when this has worked for you? I think I use these two paths every day. In the planning stages of projects, it avoids feature creep if I can first lay out the minimum requirements to make something work.